So we're off to Cambodia today! It's a bit of a detour from our trek to Chiang Mai, but this was originally on our SE Asia bucket list, just that we ran out of steam last year. We're a bit conflicted, because although we really want to see Cambodia, we're not sure if we're up to touring and sightseeing quite so soon after our Europe burnout. There's an air of nervous tension between us because of all the research we've done. 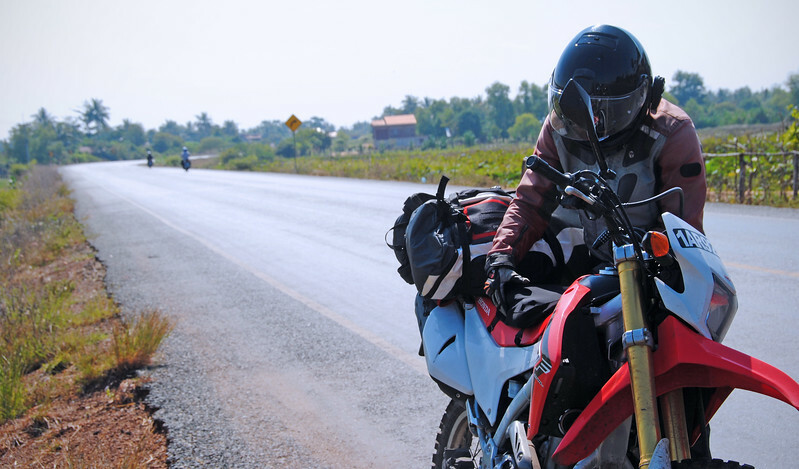 Cambodia is one of the most difficult countries to ride into. On the forums and on social media, there are so many reports of corrupt border officials giving overland travelers a hard time, denying them entry despite having all the correct paperwork. 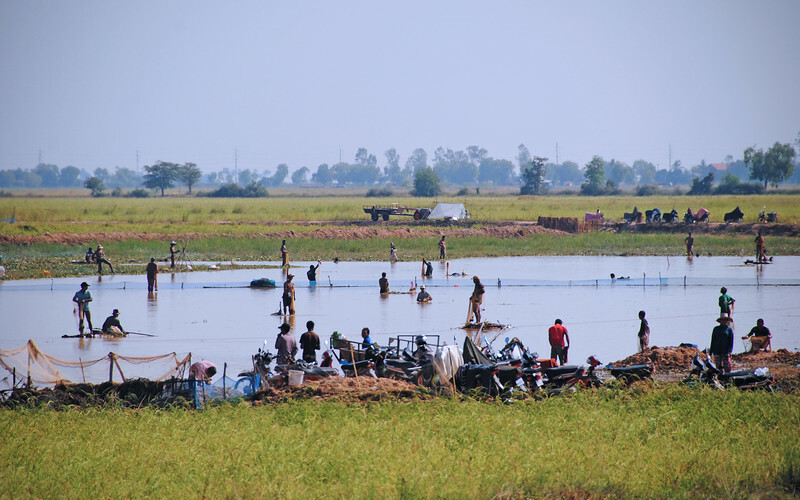 And in the worse cases, horror stories of vehicles trapped in the No Man's Land between countries - unable to get into Cambodia or re-enter Thailand again, predatory officials offering the owners paltry sums to take their vehicles away. 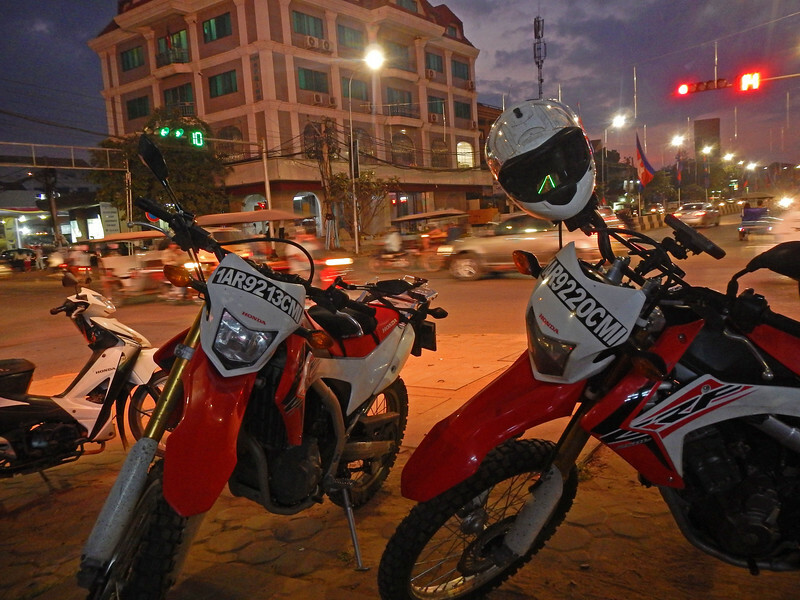 I've read that the Cambodian police pull over non-Cambodian motorcycles and fine them on the spot (ask for bribes) for having Daytime Running Lights. We're just trying to mitigate any problems beforehand and try not to give anyone any reason to stop us. 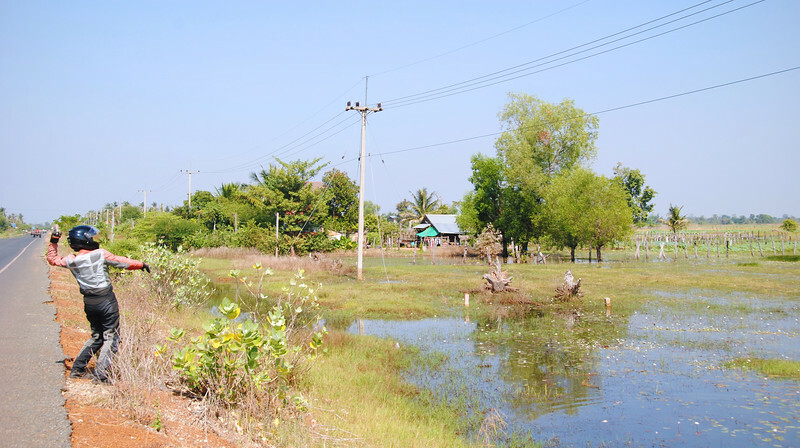 So we chose this smaller, rural crossing of O'Smach in the north because we've read that the Cambodian officials here were more lax about letting foreign vehicles through. It' a bit out of the way from the main highway, but again... forewarned is forearmed. It's a bit frustrating and unnerving to enter a country where the rules change from crossing to crossing, as well as day to day. Timely information has never been so important. 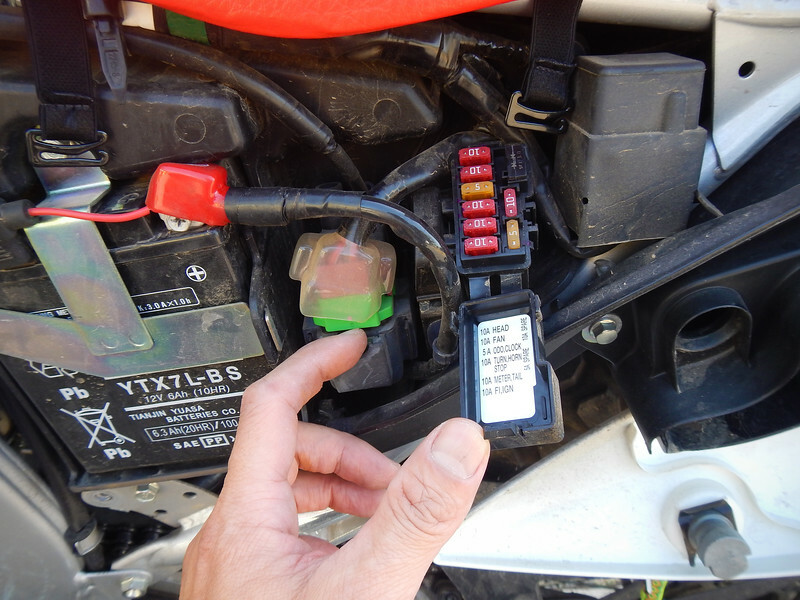 The Internet has been a boon to overland travelers. 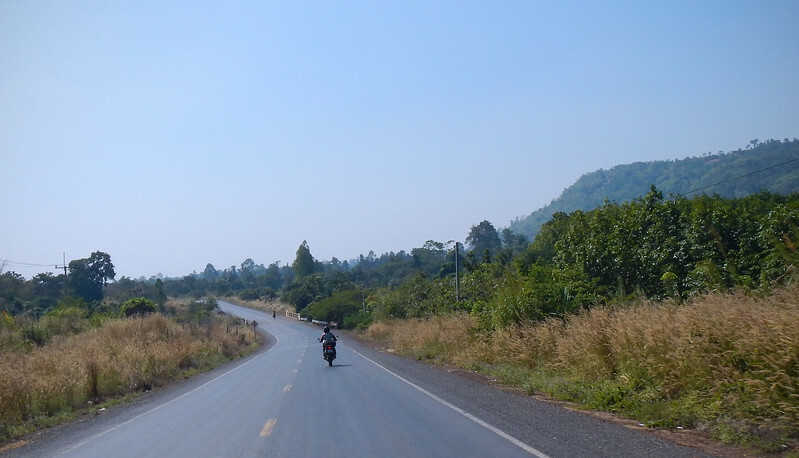 Still, even with all the research we've done, I am plenty anxious as we approach the cluster of buildings that mark the border between Thailand and Cambodia. Step 1 was dead easy. The Thai border officer quickly checked to make sure we hadn't over-stayed our visa and with a swift KA-CHUNK, our passports were marked with an exit stamp. Sorry, no pictures. We were nervous enough as it was, didn't want to give anyone a reason to stop or deny us entry! 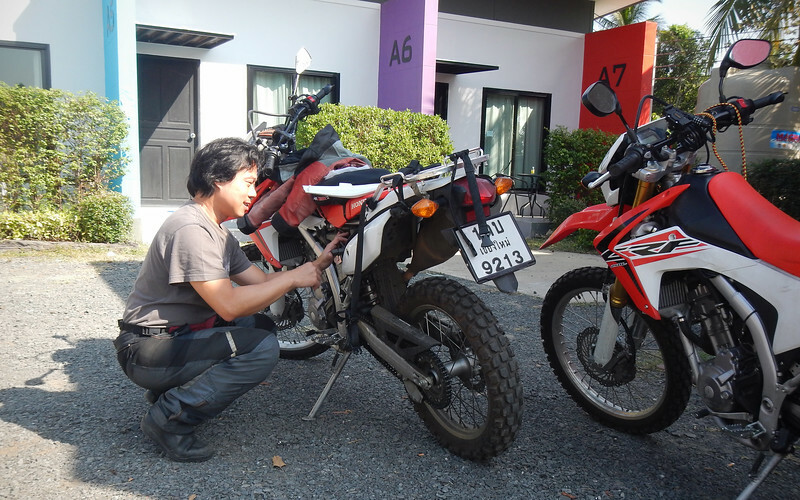 Okay, Step 2: Getting our bikes exported out of Thailand. This shouldn't be a problem, we did it in Malaysia, the process is simple. So that's what we did. But unfortunately we told this to *THE WRONG SIDE*. The Thai customs official asked where we were riding to. 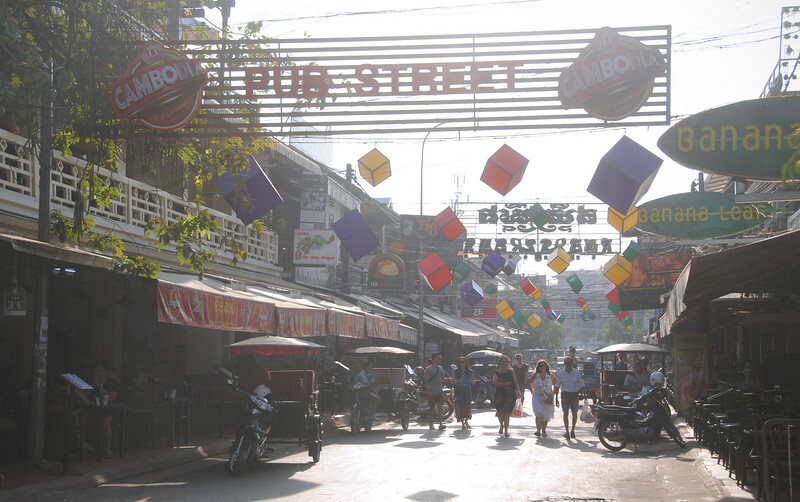 "Siem Reap", I replied confidently, my well-rehearsed lie rolling off my tongue like honey. 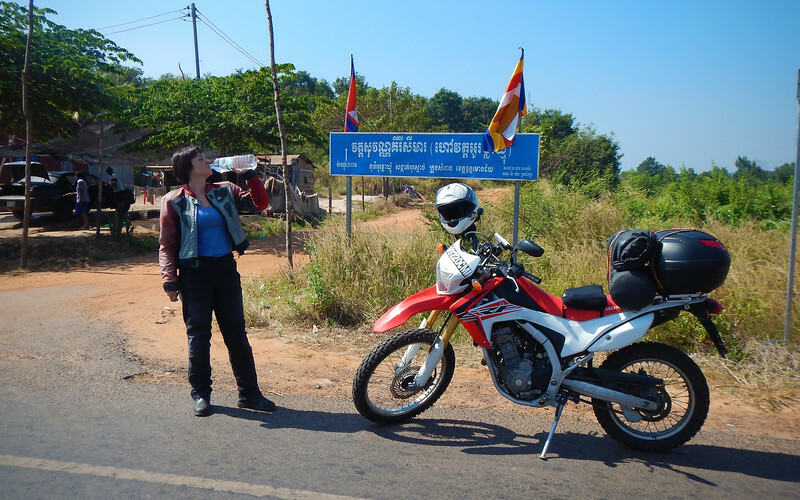 We were planning on going much farther than Siem Reap. A couple of things immediately stood out. Second, we were only given two weeks export permission. What? Normally we're allowed to be out of the country for a month! I questioned the Thai official, "Is this right? Only two weeks? Why not 30 days, like before?" 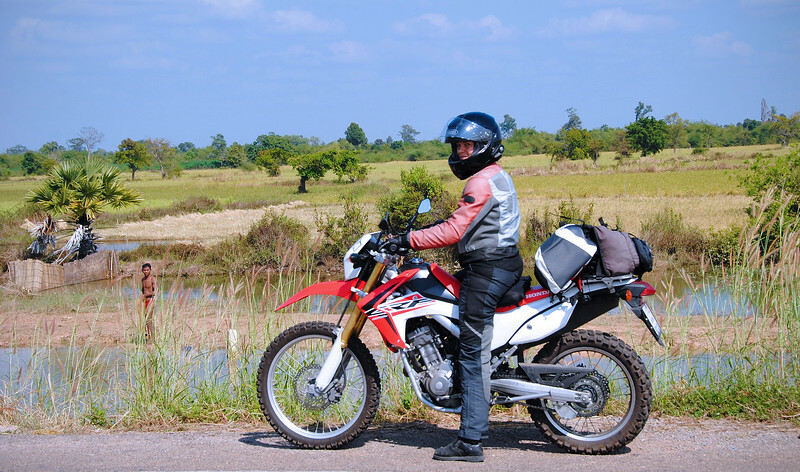 He replied, "You are only going to Siem Reap. Not far. Only two weeks." NOOOOO!! I was so worried about getting into Cambodia, I was not expecting to be screwed by the Thai side exiting Thailand!!!! Why did I tell the Thai official we were only going to Siem Reap? 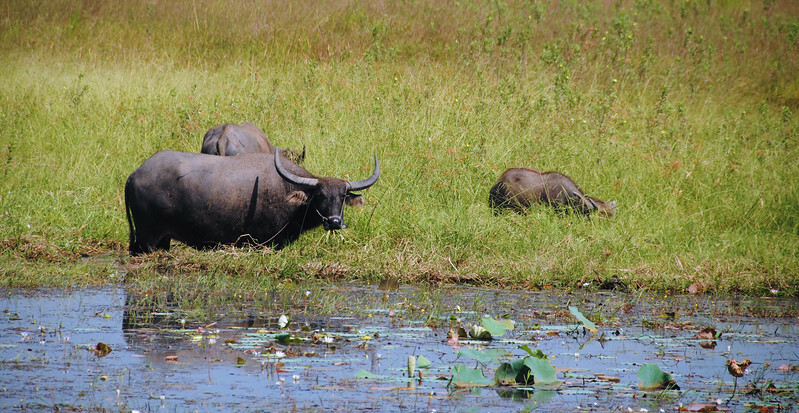 He didn't care how far we went inside Cambodia?!?! DAMMMIT!!!!! I tried arguing for the usual 30 days, but the official wouldn't budge. Now we'd have to rush through the whole of Cambodia in two weeks. We don't rush. It's not what we do. Plus we are still travel fatigued. 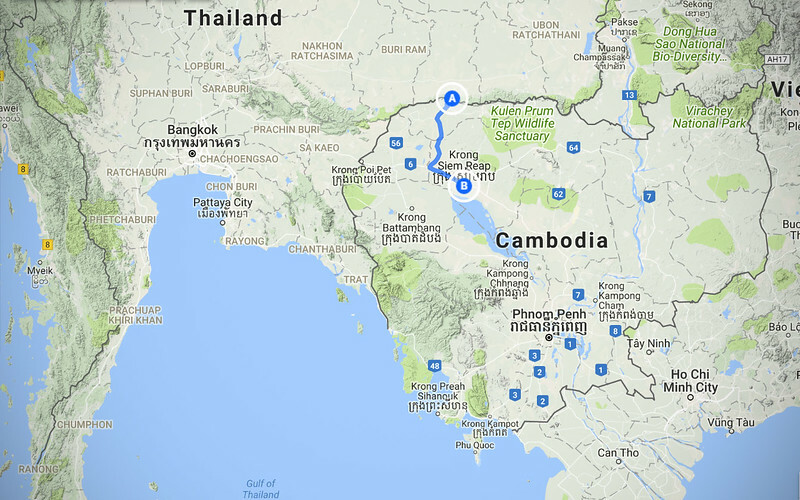 Suddenly, this whole Cambodia side-trip didn't seem like such a good idea. But it was too late. 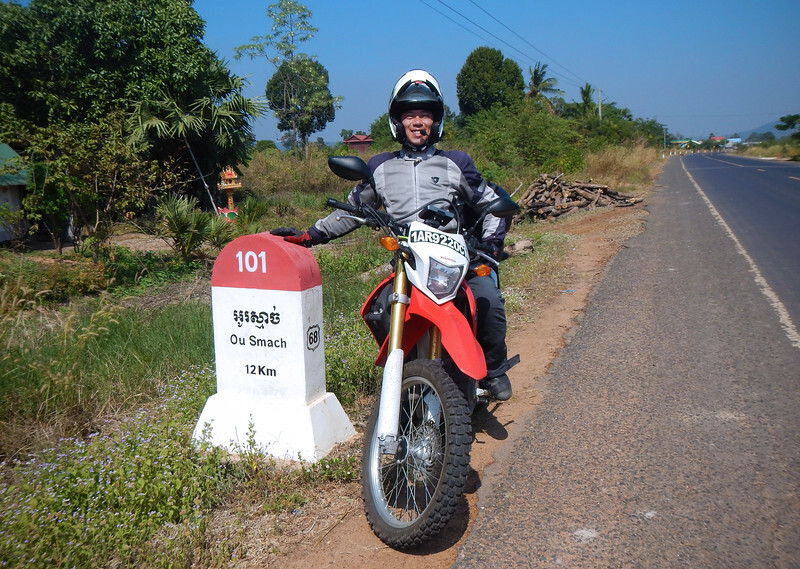 Us and our motorcycles were already stamped out of Thailand. We were in between countries, in No Man's Land. 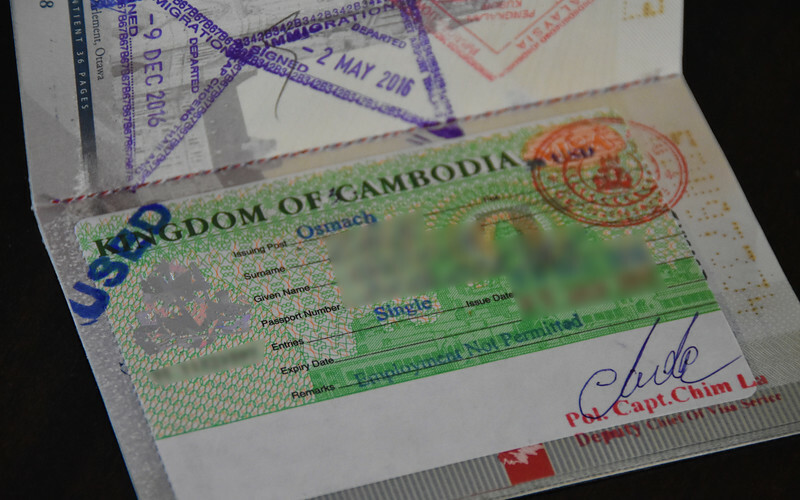 We trudged over, dejected, to get our visa-on-arrival at the Cambodian office. Step 3. The guy at the office overcharged us $37 for a $30 visa. I read about this. You can put up a fuss and after a lot of time and hassle, they will eventually charge you the right amount. A real proper scam they pull on *everybody* that passes through. But at that point, we didn't care. 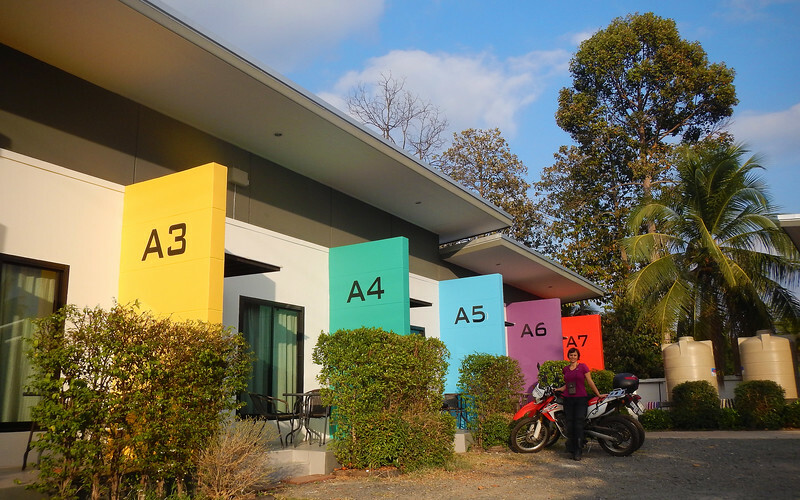 We were too crushed by our two-week limitation imposed by Thai customs. Whatever. Anyway, the real hard part was now here. 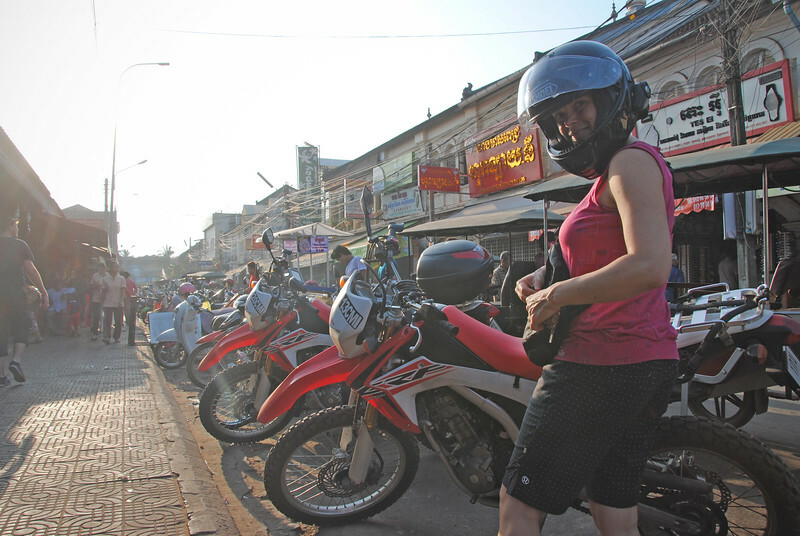 Step 4: Getting our motorcycles imported into Cambodia. 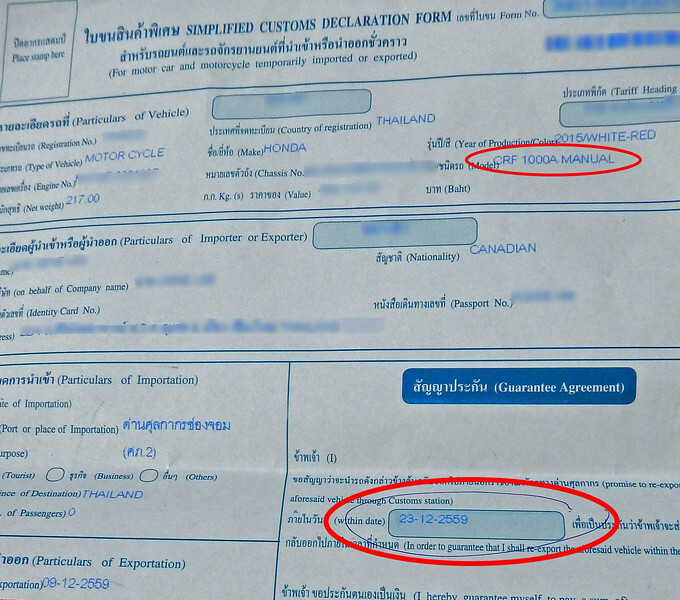 We gathered all of our vehicle papers and the Thai exportation letter to bring to the customs office. Filled out the importation form and made sure everything was sorted and in order and handed the neat pile to the Cambodian official working behind the counter. He didn't even look up at us or come out to look at the bikes. Just glanced at the papers and waved us through. No fees. No questions about where we were going. No additional paperwork. What? Just like that? All that worry and we were just let in like that? 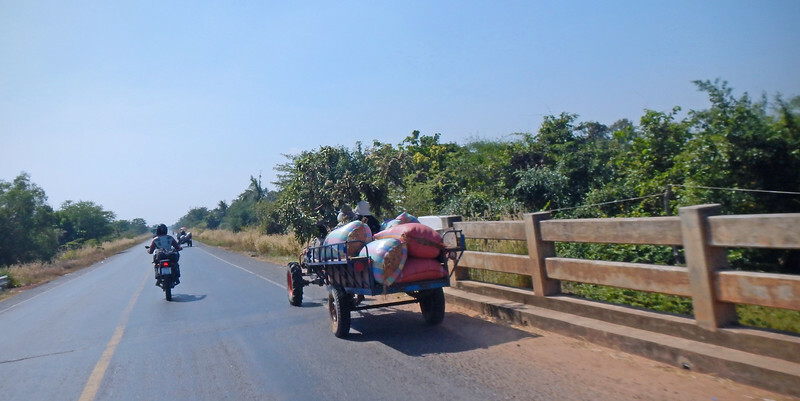 Oh yeah, they drive on the right-hand-side in Cambodia. So much switching in the last year, our brains are getting a bit frazzled. But still, being in a new country is always exciting because we're interested in seeing what will be different than the place we just left. So we continue to be illiterate in Cambodia. I guess sometimes it pays to do your research. Next time, we'll have to tell the Thai customs guys we are going ALL OVER CAMBODIA AND SE ASIA! Give us the 30 days! 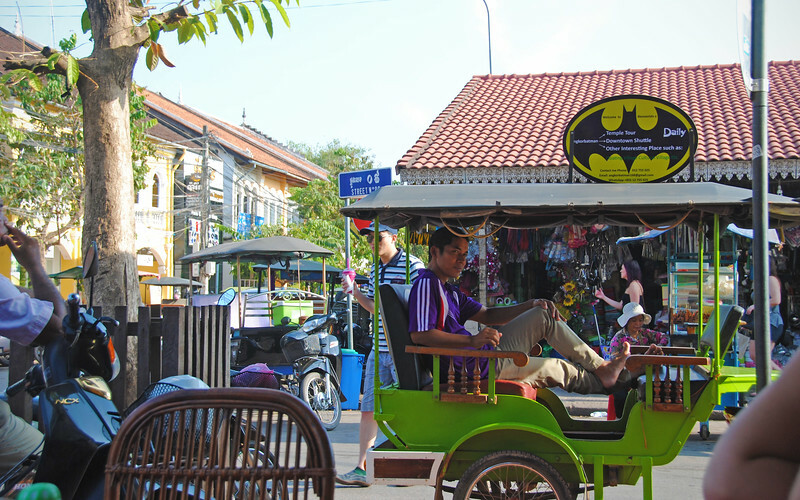 Thankfully, Siem Reap is only two and a half hours away from the border. And we take lots of photo stops. "Why are you throwing rocks at me, human?" Just kidding!!!! She was just throwing rocks into the marshes. She's actually quite an animal lover. The standard of living is definitely lower than Thailand. A lot less industrial, at least up here in the north. Our "big bikes" are getting lots of stares and a few Cambodian kids (mainly the boys) give us the thumbs up as we ride by. 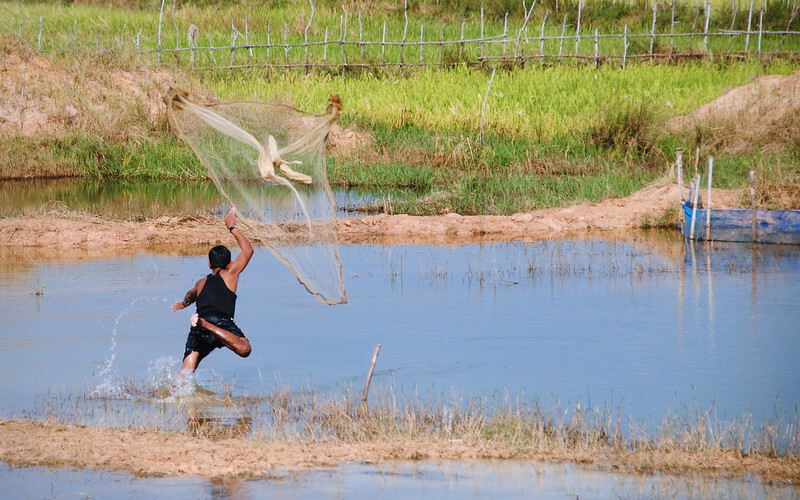 They were casting their nets into the marshes and then diving in to collect their catch. Neat stuff. And then we found a larger body of water and tons of fishermen there. I wonder what they were catching. Speaking of which, we were getting hungry. It was a long day and we wanted to reward ourselves with a nice sit-down meal in an air-conditioned restaurant. Treat ourselves! 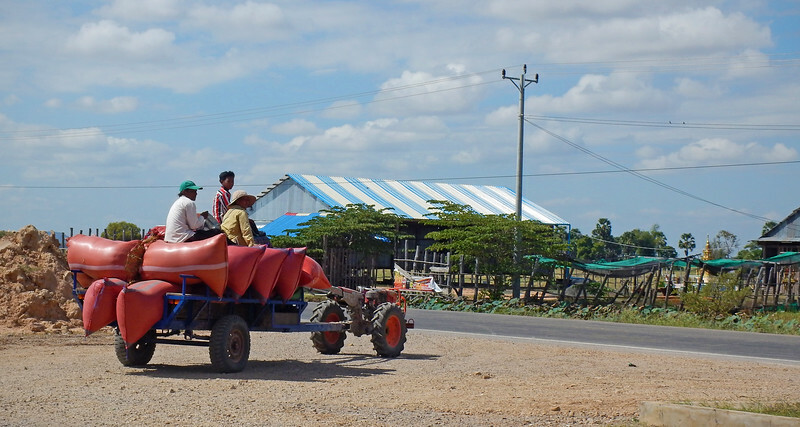 Villages turned into larger buildings, tractor-engines turned into cars, in no time we found ourselves swallowed up in the big city of Siem Reap. A lot of people think Thai traffic is chaotic. Cambodia is worse. Motorcycles get much less respect on the road here. Cars whiz past with no room to spare, expecting you to get out of their way. But the biggest difference from Thailand: honking. I did not notice how restrained Thai drivers were with their horns. Not so in Cambodia. Everybody beeps here. It wasn't as bad as India, but definitely a big change from where we just came from! 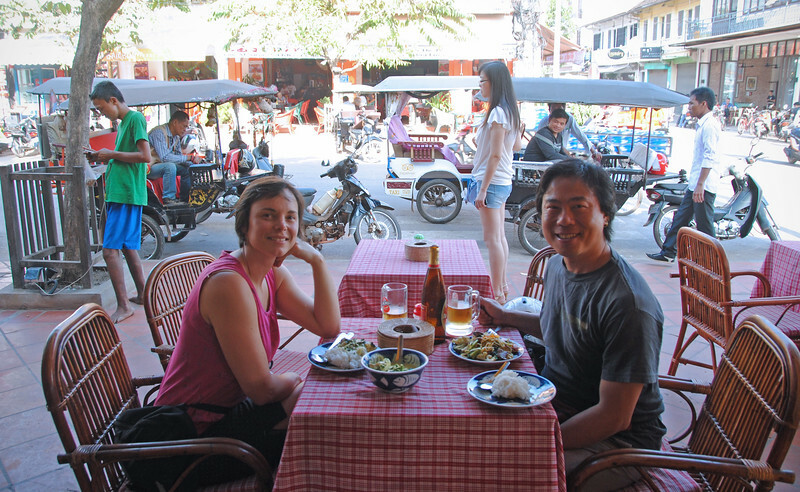 We pulled into the first touristy restaurant we saw in Siem Reap. We were in the mood for seafood after watching all the fishermen earlier on. When we sat down to look at the menus, we realized that despite all the research we had done on how to get into Cambodia, we actually didn't bother finding our what currency they use here. The stuff looked pretty cheap, 30-50 something for a meal. If the currency is like the Thai Baht, that's like $1-$2 for a plate. Not bad. We asked the waiter what the exchange rate was. He told us everything on the menu was priced in US dollars. Excuse me? $30USD for a plate of seafood in Cambodia?!? This was the first restaurant we went to in this country, so we weren't sure what to expect. 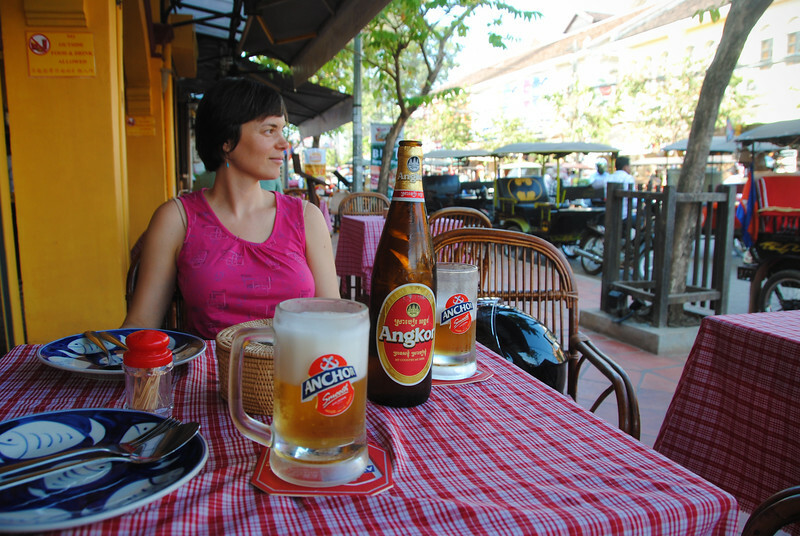 Cambodia had already ripped us off for the Visa, we were *NOT* paying $30USD/plate for food. We've never paid $30 for food anywhere in SE Asia! 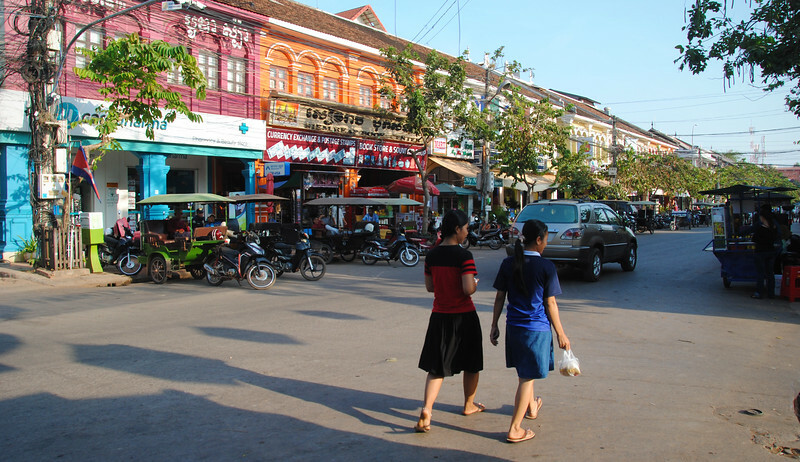 We beat a hasty retreat back out into the streets of Siem Reap. At least we learned that they use USD here, so we don't have to exchange currency. Is Cambodia really that expensive though? Inside the mall, we found one of those family restaurant chains, like a Kelseys or Applebys. Very western, but we didn't care. It was cool inside and it had nice comfy booths where we could spread out all of our gear. A quick check on their prices revealed that Cambodia is not that expensive. 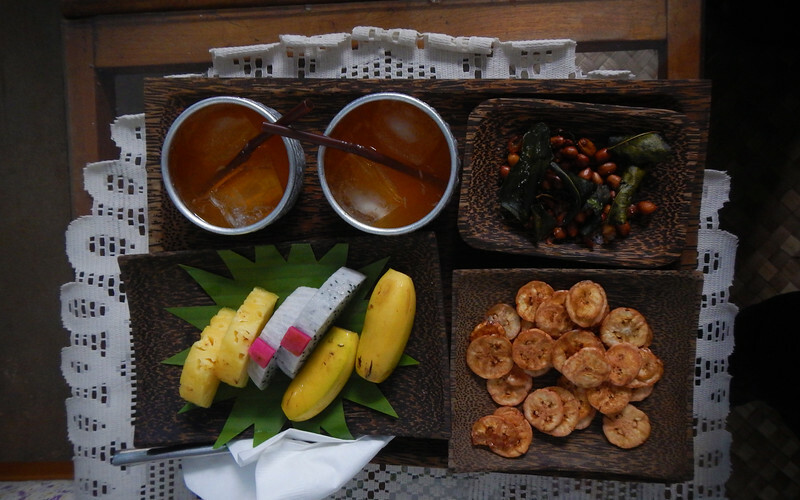 Food costs a bit more than Chiang Mai, around Phuket prices... It was like $10 each for a nice sit-down meal. I suspected we were paying more for the air-conditioning! Street food would probably be less than half that. I can't believe that first restaurant. 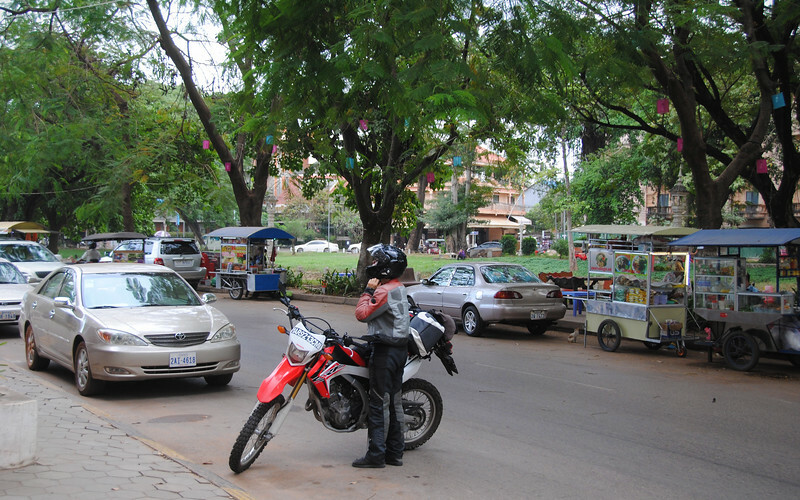 Probably tried to sucker in the tourists who stop at the first restaurant they find in Siem Reap. Crazy! We did splash out on a nice and fancy hotel for our first couple of nights in Siem Reap though. You can tell how nice it is by the welcome tray they serve you when you check in. And... I forgot to plug in the fuse for the headlights for night riding. Very unnerving riding around the dim back streets of Siem Reap, lit only by the lights of the stalls on the side of the road. Gotta be more diligent about that fuse. So refreshing on a hot day! Tomorrow we hit the temples!